in Social Media with tags Europe, Facebook, global, internet usage, Twitter, WhatsApp, YouTube Both comments and trackbacks are closed. As brands expand their global reach, marketers face an increasingly complex ecosystem of digital platforms, people, and preferences. Globally-focused marketers must move beyond “one size fits all” messaging across countries, and toward a better understanding of regional differences in media consumption and behaviors. 360i’s Global Social Insights blog series, which we’ll be sharing as a comprehensive report following posting, serves as a starting guide to trends in digital and platform adoption across the globe. To create this comprehensive social media guide, the 360i Insights & Planning team gathered demographic data from Global Web Index and eMarketer to identify the top platforms in different countries across the globe spanning 2013 to 2015. In our analysis, clear behavioral trends emerged for Europe, North America, South America and Asia-Pacific in 2015. Each entry of this series will cover one of these four regions, highlighting trends specific to countries that were of interest to clients or possessed emerging marketing opportunities. We’ll conclude our series with a comparison across regions to provide some insight into the social media landscape at a global scale. The following analysis of social media usage trends across Europe looks at seven countries in the region with the strongest marketing opportunities: Germany, United Kingdom, France, Italy, Russia, Spain, and the Netherlands. Among these countries (excluding Russia), Facebook, YouTube, Twitter, and messaging apps WhatsApp and Facebook Messenger were the most-used social media platforms in 2015. Notably, messaging apps, which are quite commonly used in the Asia-Pacific region (APAC), showed a strong presence among European countries in 2015, with WhatsApp and Facebook Messenger making it consistently into the most-used platforms lists of all Western European countries analyzed. Russia, because of strict governmental regulation on social media and Internet access, was anomalous as it was the only country where we analyzed social media platforms VKontakte and Odnoklassniki. Both were created for the local market and took the top two spots as the most-used social networks in Russia. Facebook’s ubiquity continues to remain strong in Europe, showing up as one of the top five most-used platforms among all countries analyzed, including Russia. On average, Facebook’s penetration of the region reached 38% of Internet users across the seven countries studied. The demographic breakdown of European social media users reflected common trends; social media usage is most prevalent among millennials aged 18-34 and is relatively well distributed between men and women. There are, however, a few general and interesting nuances to highlight. First, messaging apps like Facebook Messenger and WhatsApp tend to skew towards higher females usage, sometimes by as much as 20% in certain countries like the Netherlands. Gender distribution in Italy tends to skew towards males across all of the country’s top five social media platforms. Most platforms experience relatively even age distribution with slight deviations coming from Facebook which tends to skew towards older millennials and age groups, and messaging apps which skew towards a younger demographic. 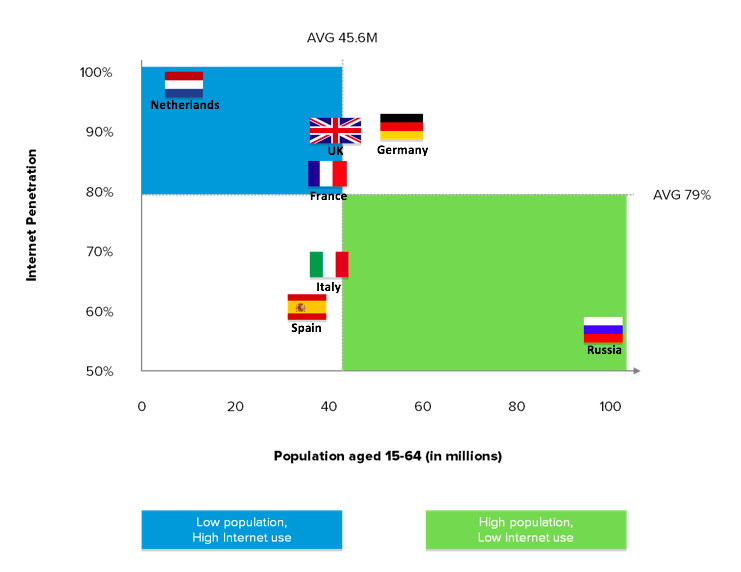 Among the seven European countries analyzed, Internet usage reached 79% of the population on average in 2015, led by the Netherlands at 96%, and Germany at 91%. The two countries with the lowest Internet penetration were Russia at 62% and Spain at 64%. Social media adoption among Internet users was not strictly correlated to Internet penetration. The countries leading the region in social media usage were the Netherlands at 62%, United Kingdom at 53%, and Russia at 49%, where it reached the highest percentage of Internet users. The countries in the study with the lowest social media penetration in 2015 were Italy at 36%, Spain at 40%, and France at 41%. Overall, social media saturation in the region seems to be growing with United Kingdom, Germany, and Russia on average experiencing 5-percentage-point growth over the last two years. Average social media usage in the region reached 46% of the Internet-connected population in 2015. Smartphone usage in Europe hovered around half of the population at 47% on average, led by the Netherlands which boasted 61% smartphone users. Russia had the lowest smartphone adoption rate among countries analyzed, reaching only 37% in 2015. Social media use continues to grow in Europe, reaching an average adoption rate of 46% of Internet users in 2015. The most significant growth among the countries analyzed came from United Kingdom, Germany, and Russia which have experienced, on average, a five-percentage-point increase in social media penetration over the last two years. As social media in Europe continues to grow, it is key for marketers to allocate more funds and resources towards these efforts. Messaging apps like Facebook Messenger and WhatsApp, are popular in Europe, making their way into the top five most-used platforms for all of the Western countries studied. Marketers should consider capitalizing on the popularity of these messaging apps to reach a younger audience in ways such as building a branded plug-in that allows users to interact with each other and the brand in an innovative, organic way. ESPN and The Weather Channel have already made their foray into this new media territory. Russia continues to pose a challenge for Western marketers to reach consumers in one of the world’s foremost developing economies due to state regulations and censorship. While some sites like Facebook are currently accessible in Russia, the government has been known to threaten a nationwide online blockade which would limit access for all but the most tech-savvy inhabitants able to sneak around the censors. When looking to reach the largest market within Russia, marketers should not neglect to create content for local channels such as VKontakte and Odnoklassniki where most Russian social media users engage (47% and 38% of Internet users, respectively). 360i’s Insights and Global Planning Committee contributed to this post.